Abstract In the last issue, I mentioned Clifford White's horse drawn hearse. Although it was last used before the War, when I started work for Clifford in 1946 it was still tucked away in the little garage by the plumber's shop. I had always hoped that it had been sold and was still in use somewhere. My hopes were dashed when chatting to David Conway in the Museum recently and he told me he helped break it up when he worked for Clifford White in 1964. 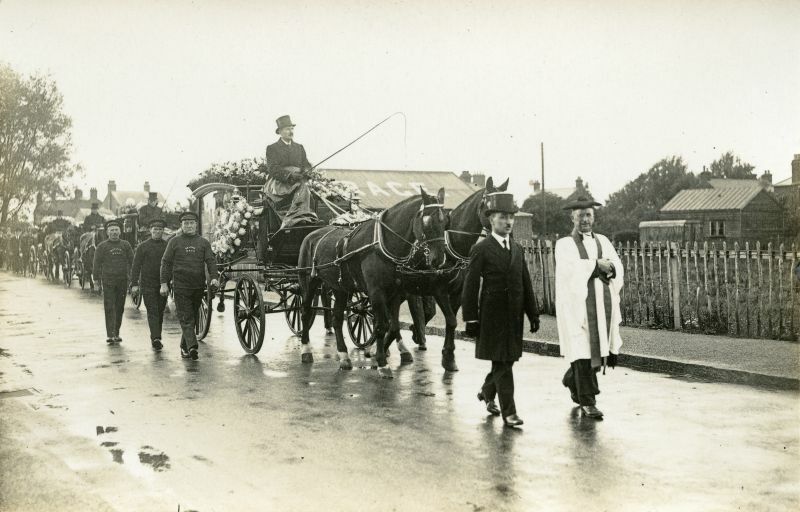 The picture shows the hearse in use for the funeral of John Hewes in 1931. The cortege is seen in Barfield Road, with the roof of Griffon Garage in the background. It is just about to turn into the Cemetery. Undertaker Clifford is leading, always immaculate, his shoes highly polished and not a thing out of place. The Revd. Pierrepont-Edwards is also walking in front, and the hearse is driven by Mr Gethen. The three pallbearers in their yachting jerseys are George 'Hoppy' Hewes, Sales 'Dubby' French and Alfred 'Daff' Hempstead. There are another three on the other side of the hearse. After Clifford White died, Hardy Weaver carried on the business in Clifford's name and eventually John May started up to fill the gap. John had served a woodworking apprenticeship at White's where one of his teachers was my brother John Green all working under the watchful eye of Sid Stoker the joinery shop foreman where they made the coffins.